In 2014 the City of La Canada Flintridge requested that LCVB provide new drought tolerant landscaping for the planter with a new sign at the entrance of Lanterman Auditorium. LCVB chose Kathy Meinhart Garden Design to design and implement the project. Kathy and her very creative and talented team were able to use some of the existing plants with new plants woven into open spots. Improvements also extended to the areas to the east of the entry to the auditorium and down the east side of the building including existing agapanthus which were transplanted along Cornishon Avenue. 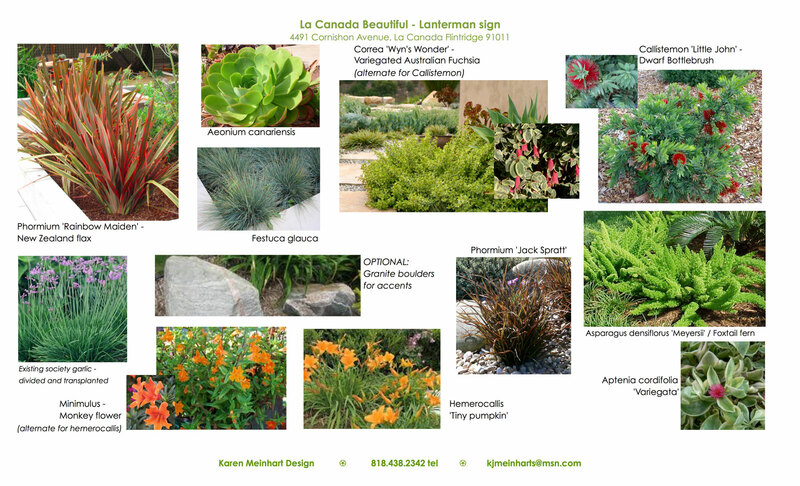 We will be adding plant identification signs to many of the plants, and hope that all who pass by the Auditorium or walk down Cornishon Avenue will find our drought tolerant garden planters interesting as well as informative.